It was brought to my attention last night that The Oatmeal was trying to help turn Nikola Tesla's lab into a museum. At one point The Oatmeal's Matthew Inman tweeted Elon Musk — Tesla Motors CEO and Tesla fan — asking him if he'd like to help. I don't know how many people have the email addresses for both Elon Musk and Matthew Inman, but I know I am one of them and so I e-introduced them. 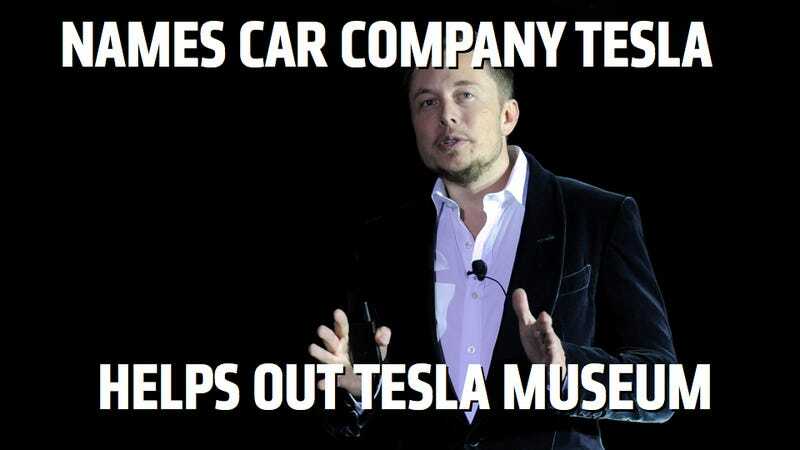 Musk responded, stepping up and agreeing to help. Despite our sometimes strained relationship with the car company, Musk and Jalopnik actually agree on a number of important issues (McLaren F1s should be driven and space exploration is a necessity for the human race). You can join Musk and (to a certainly much much lesser degree) us in supporting this endeavor. Also, consider this an open invite to Musk to talk about why Tesla is one of your heroes.